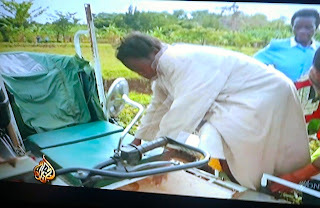 Bodaboda Baby: Meet the boda crash survivor who did those great special effects with cotton wool and iodine. UPDATED. 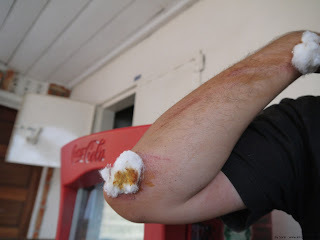 Meet the boda crash survivor who did those great special effects with cotton wool and iodine. UPDATED. Oh no not I, I will survive. Boda crash victim Sorin in Kampala. Before bodabodas were crashing with the author of this blog on them, they were crashing with Sorin, above, the author of another blog, on them. There wasn't a great deal of time between our crashes, either. Such is life in Uganda. Sigh. Regular readers of this blog will recall that I came across Sorin's post, "First Boda Boda Crash" while writing an account of my own accident. "Noticed the sign for my accommodation place and then suddenly the crush happened," writes Sorin, who had travelled from Fort Portal, where he'd been volunteering in an orphanage, to Crater Lakes. "I a second I was down, the wheel crossed a little over my chest, my hands were walking on the gravel! Managed to stand up in seconds and first was the damage control look. Head was in good shape, only a small bruise on the chest, the leg a bigger bruise but no bleeding. The bad parts where only the right hand and the elbow; both bleeding with some superficial cuts." 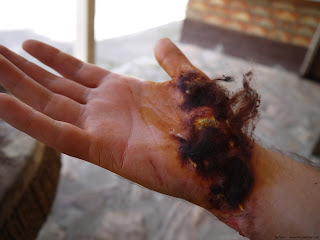 After reading on, I was particularly amazed by Sorin's ability to do special effects with iodine and cotton wool (see pics below). Only unlike Bodaboda Baby the Romanian, who's spending six months or so on the trip of a lifetime which began with Uganda, isn't on his way to The Priory for iodine addiction. Or at least this is what he claimed during a coffee we had earlier today at Javas Oasis Mall. Well, boda crash survivors do need to stick together after all. Sorin, 30, sustained grazes on his hands along with bruises on his chest and legs, in his accident. Ouch. 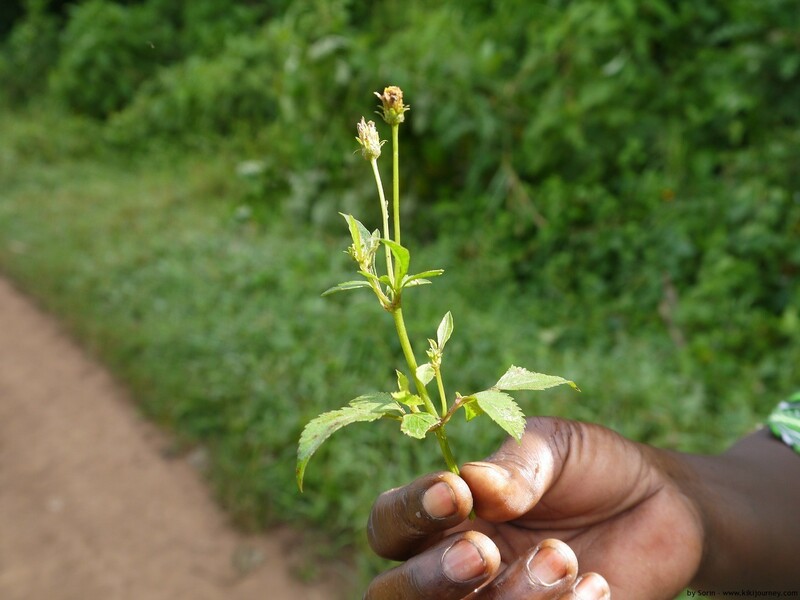 "(But) the recovery went very well, I think because of local medicine," said Sorin, who used a local plant called enmabarasana (or so we think), given to him by a hostel owner, for his wounds. (NB: cannot find any information on this plant on the internet, so if anyone can shed any light on it please let us know). "It worked like magic. In a day-and-a-half I felt better." 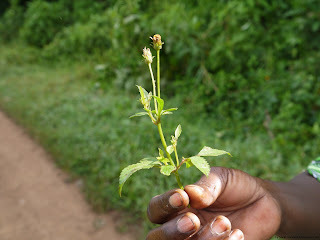 Enmabarasana, the plant which Sorin was given after he'd had his accident. Photo courtesy of Sorin. The famous shot from his blog, after his accident. Tricky. Will have to remember this for next time (just kidding). If we go a bit closer there are signs of injury, but luckily Sorin is healing. He described the pain after the pharmacist put iodine on his wounds as "unreal". But three weeks after his accident Sorin was "back to normal". I was sad to hear however that he's also been the victim of a robbery, with the thief a - gasp - boda driver. Sorin was taking a boda from Jinja Road to Mengo Backpackers when he was "hijacked", with the help of another driver, and robbed before the duo fled. Sadly, there are good eggs and bad eggs in this world, and it turns out that there are even bad egg boda riders. Despite his two hairy boda incidents, Sorin got back on a motorbike. "It's the cheapest and fastest way to travel in Uganda," he admits, adding there's not a lot of motorbikes in Bucharest, where his home. "I'm asking them to go a bit slow since I had my crash, but apart from that I don't have a problem." No doubt though Sorin will be relieved to get to South Africa later this week and have a break from the bikes, before heading to Rwanda in a month's time, where he's promised to report back to Bodaboda Baby on any boda developments. Sorin now has some advice for all boda users in Uganda. "The good thing I've learned from (the) Uganda experience is don't travel alone by bodaboda at night. Not anywhere. No way," he says. "Maybe with two people, but not alone." Oh, and unlike the author of this blog who likes to test out her parents' love for her, Sorin's not relaying his experiences to his mother until he gets back to Romania. "I don't want to scare my family, no-one knows. They're going to think of me everyday (otherwise). I'm going to be home in August, but until then I'm not telling my Mum." Bodaboda Baby wishes Sorin all the best for the rest of his travels in South Africa (one of her fave places in the world), Rwanda, Kenya, Tanzania and Zambia. Please take care, and we'd love to hear any boda stories you have. Sorin will also be back to writing his blog once he arrives in Joburg later this week. * Thanks to loyal reader and follower, fellow antipodean and African lover, and rugby fan Donna Langdon, who's become a good little boda spotter-er and pointed out this story, via Africa is a Country on www.urbanafrica.net headlined "Police impound over 2000 boda-boda in Kampala". According to the report, which quotes an earlier New Vision story, some cyclists whose bikes were seized were carrying up to seven school children in various Kampala suburbs. Crikey. Up to seven. The most the author of this blog has seen is five. The Urban Africa piece also mentions an All Africa report which claims about 80 per cent of 20 to 30 years-old are earning a living through bodas. Amazing stat, if true. Donna also Tweeted me this pic below of a bodambulance from SBS World News Australia on Thursday night, which appears to have come from Al Jazeera correspondent Malcolm Webb's report (you can watch it by clicking on that link). Regular readers of this blog will recall that Mike Miesen wrote a story on this for the blog a few posts back. Footage from Malcolm Webb's Al Jazeera report on bodaambulances, as seen on SBS news in Australia, via Donna Langdon. * The Daily Monitor on Tuesday reported in this Budget yarn (antipodean speak for story) that the Ugandan government has agreed to increase boda registration fees by 70,000 Ugandan shillings ($27.37 USD) to generate an additional 5 billion shillings ($1,955,069). * Finally an update on #SaveMiniSkirt. After this story broke, Bodaboda Baby was reaching for her seam ripper* and ruler. She was also, after perusing the pages of Grazia UK (see article below), preparing to clear her wardrobe out and purchase some twirly-wirly "lady length" skirts, which's she's been informed will take care of not only the "chill factor", but a "style rut", too. Although of course there's a great danger that these could get caught up in the wheels of a motorbike. According to this story in the April 8 issue of Grazia, "old-school, ashamedly feminine" skirts with a "long hemline (between midi and ankle") are "proving popular with the street-style pack". 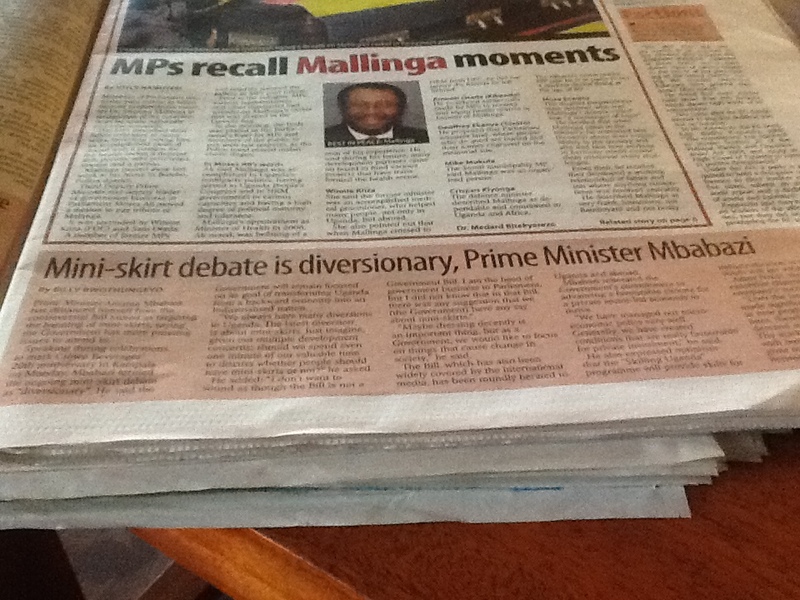 The miniskirt headline in today's New Vision. 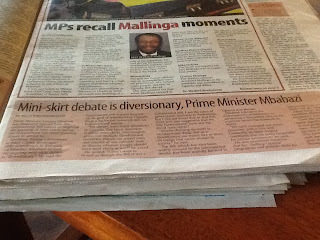 But following this report in today's New Vision (above), Bodaboda Baby is wondering if she'll ever get back all the hours of her life she's spent consulting How to Lengthen a Hem has been a waste of time. And this isn't even mentioning the fact that she cannot sew to save her life. Until next time, please take care on the roads. I leave you with this song, dedicated to all boda survivors.